This is the fourth and final part of a four-part Western Wire series. You can read the first part here, the second part here, and the third part here. “At least that is temporarily at rest, although generally you see in all legislatures a bill come in once, and then again, and again, and again. They’ll try to push it through every year,” he added. “It’s safe,” Waters said, referring to hydraulic fracturing, or fracking. Senate Bill 459, which attempted to impose a four-year moratorium failed to move out of committee in 2019. “The facts just weren’t there. We’ve been fracking in this area of New Mexico for over fifty years. We’ve never had a single incidence of any type of compromise of our aquifers or our drinking water resources,” he said. Waters was formerly a utilities director for the City of Carlsbad and managed the aquifer program and was the first oil and gas inspector for the city. “That probably is the most alarming thing, it was not based on fact. It was fear-mongering,” Waters said. “We all in New Mexico want to make sure the environment is clean, and that includes the oil and gas companies. Every company down here is interested in making sure they don’t mess in their nest. They’ve been great corporate partners with the community,” he added, with bigger companies leaning on their subcontractors heavily to ensure laws are followed and to prevent even the hint of adverse effects on local communities. While there was some relief in the aftermath of the session, Waters said, the outcomes were mixed. “We are concerned about a lot of the attacks that took place, but the really big ones [bills] were stopped,” he said. For example, the state heard Carlsbad’s call for infrastructure relief. Waters said his county, Eddy County, and other local communities in the area, like neighboring Lea County, needed money reinvested in the roads, given the tremendous contribution that southeast New Mexico makes to the state’s coffers, such as for education, as Western Wire has reported in this series. Waters said that traffic counts in Carlsbad were comparable to intersections in Albuquerque, but with heavy truck traffic instead of passenger vehicles, the impact to the roads was palpable. “It’s nice to see some of the monies coming down here, we’re going to get a chunk of that, and we’re grateful,” he said. But for Waters, as with Steve Vierck, President & CEO of the Economic Development Corporation of Lea County (EDCLC) that Western Wire featured in the second part of our series, vigilance from southeast New Mexico was paramount. “We’re going to keep watch. Our goal is try to educate folks in Santa Fe and around the state,” Waters said, and that includes insisting that they listen to local officials with the on-the-ground experience. 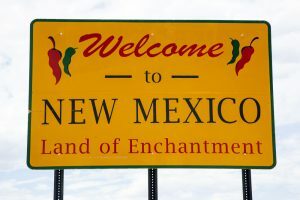 “We invite all the state folks down, because we know that not everyone is familiar with our situation and how much revenue comes from southeast New Mexico,” he added. According to Waters, roughly one third of the state’s general budget and 90 percent of the state’s severance tax income is derived from production in Eddy and Lea counties. Waters said that in the past, other state natural resources like copper and uranium mines were more productive, but that that production has decreased, leaving oil and gas to fill the gap. “We worry that the oil and gas industry, because the Delaware Basin is underneath both Reeves County, Texas and Eddy County in New Mexico, those are the two biggest counties with the biggest growth in the premier basin in the western hemisphere” could leave the state, even temporarily, he said. “If things get too hostile for production in this area, they could easily go right across the state line and operate on private land where they don’t have as much bureaucracy to go through,” Waters said, pointing to copper mining that moved out of New Mexico in favor of neighboring Arizona. There are resources in both places. Large companies with resources in both locations can “hold their breath” and operate in Texas, awaiting a more favorable climate in New Mexico, according to Waters. But a change in regulations won’t just affect the oil and gas industry. Developers interested in serving the housing demand in Carlsbad and surrounding areas would also feel the pinch, he said. “We need housing in a terrible way here, a little bit different than Weld [County, Colorado], because we are in a serious boom. Before the boom, Carlsbad and southern Eddy County had a population of about 43,000 in the 2010 U.S. Census. We were short on houses then. Now we’re approaching 10,000 short as far as housing units go,” Waters told Western Wire. Waters said his community and neighboring areas are working hard to bring in developers to build apartment complexes. “We’re not like the Bakken, which had only 10,000 people. Carlsbad has the resources for growth, but the infrastructure costs are high, and really to get the problem alleviated you’ve got to get housing in,” he added. “When the environment started to change and there was an announcement that they were going to propose a ban on fracking for four years, that hit the newspapers in Dallas and Houston and that seriously affected people that were looking at coming to Carlsbad,” he said. Waters pointed to companies that had been in talks about possible projects adopting a wait-and-see approach once the adverse legislation was introduced, as a “hostile environment to industry” could mean empty apartment complexes. “So that did affect us. We also saw a little bit of that in retail,” Waters said, noting immediate impacts to proposed legislation that failed to pass. A change in the regulatory framework would be devastating, he continued. “The oil’s here. The companies that make the investments, they’re going to stick it out. We’re trying to sell that side. But in the back of our mind, if Santa Fe comes up with a bunch of unreasonable regulations that inhibit or prohibit drilling, one of the two, we’re going to see a hit on several areas of our community, not just the number of drillers in town,” Waters said, including regional offices and infrastructure. “The way you throttle growth is you throw a bunch of regulations in that aren’t based in fact, that make it harder for an industry to feel welcome in the state,” he said. New Mexico has, seemingly overnight, become the 3rd largest producer of crude oil and 9th in natural gas production through 2017, according to the U.S. Energy Information Administration. “We like to promote ourselves as the prettiest oil town in North America. We’ve got a very vibrant, outdoor eco-economy,” Waters said. “This can be done right. This isn’t a short-term play. The lifespan of some of these wells around here” could be as much as 50 years, he added. Waters closed with a plea to the legislators in Santa Fe. “If they let it [drilling] grow, our state can really develop and thrive,” he said.